Climatesense-norpag: The Imminent Collapse of the CAGW Delusion. The Imminent Collapse of the CAGW Delusion. 1.The Problems with the IPCC - GCM Climate Forecasting methods. "Reductionism argues that deterministic approaches to science and positivist views of causation are the appropriate methodologies for exploring complex, multivariate systems ... where the behavior of a complex system can be deduced from the fundamental reductionist understanding. Rather, large, complex systems may be better understood, and perhaps only understood, in terms of observed, emergent behavior. The practical implication is that there exist system behaviors and structures that are not amenable to explanation or prediction by reductionist methodologies ... the GCM is the numerical solution of a complex but purely deterministic set of nonlinear partial differential equations over a defined spatiotemporal grid, and no attempt is made to introduce any quantification of uncertainty into its construction ... [T]he reductionist argument that large scale behaviour can be represented by the aggregative effects of smaller scale process has never been validated in the context of natural environmental systems ." Paradoxically they still claim that UNFCCC can dial up a desired temperature by controlling CO2 levels .This is cognitive dissonance so extreme as to be irrational.There is no empirical evidence which proves that CO2 has anything more than a negligible effect on temperatures. 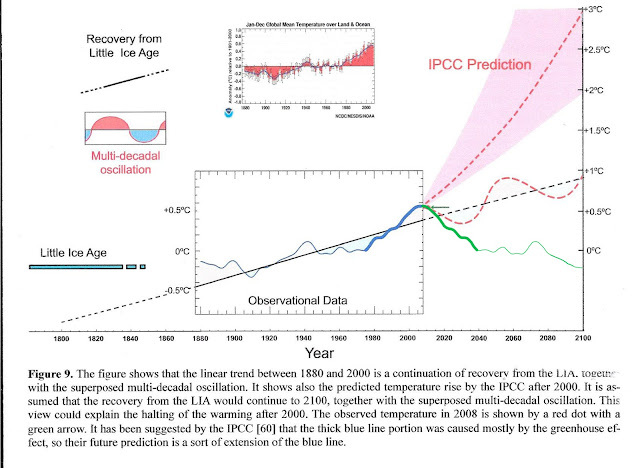 Figure 1 above compares the IPCC forecast with the Akasofu paper forecast and with the simple but most economic working hypothesis of this post (green line) that the peak at about 2003 is the most recent peak in the millennial cycle so obvious in the temperature data.The data also shows that the well documented 60 year temperature cycle coincidentally peaks at about the same time. The core competency in the Geological Sciences is the ability to recognize and correlate the changing patterns of events in time and space. This requires a mindset and set of skills very different from the reductionist approach to nature, but one which is appropriate and necessary for investigating past climates and forecasting future climate trends. Scientists and modelers with backgrounds in physics and maths usually have little experience in correlating multiple, often fragmentary, data sets of multiple variables. It is necessary build an understanding of the patterns and a narrative of general trends from the actual individual local and regional time series of particular variables. Earth's climate is the result of resonances and beats between various quasi-cyclic processes of varying wavelengths. 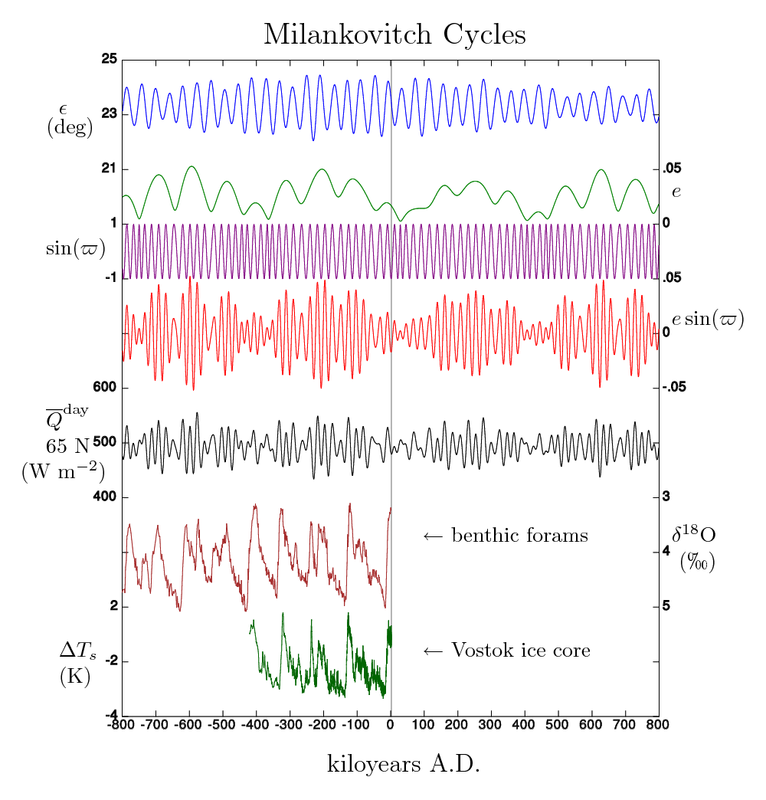 2.3 The Quasi - Millennial Solar Cycle -Periodicity. 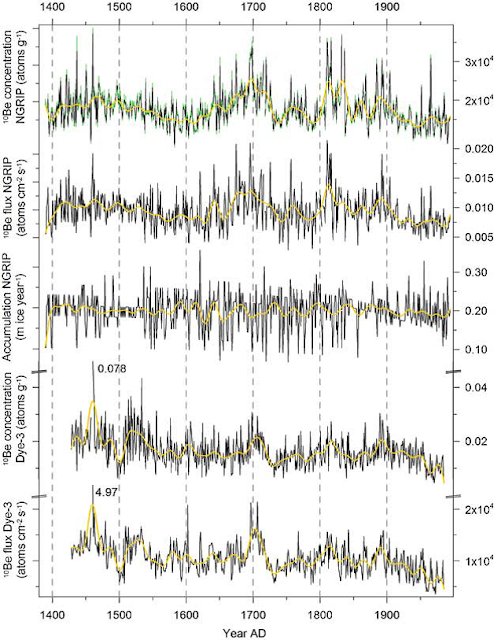 Note the peaks at about 10,000,9000,8000,7000,2000,1000 BP and then the latest peaks seen more clearly at about 990 in Fig 4 and about 2003 in Fig 5. 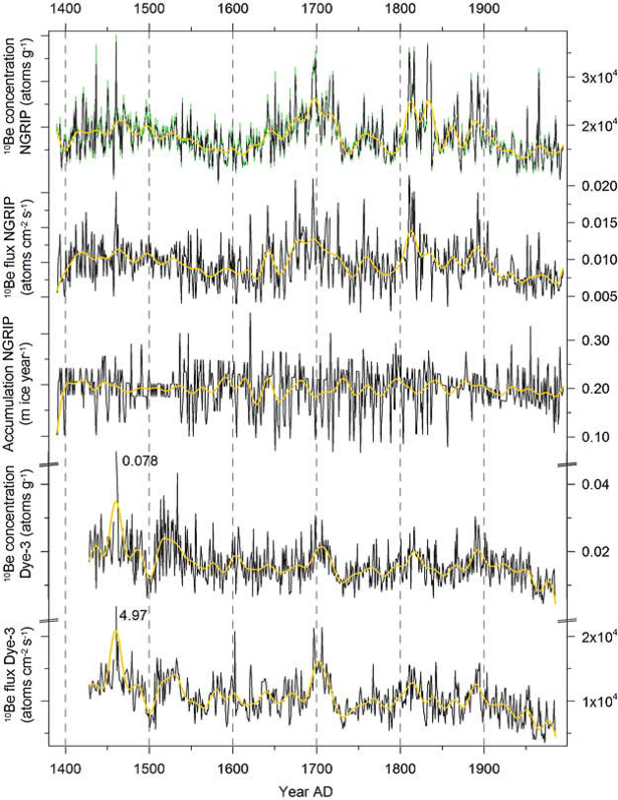 Fig 5 is the RSS data and Fig 5a the Hadcrut 4 data which shows a small difference in the timing of the millennial peak. 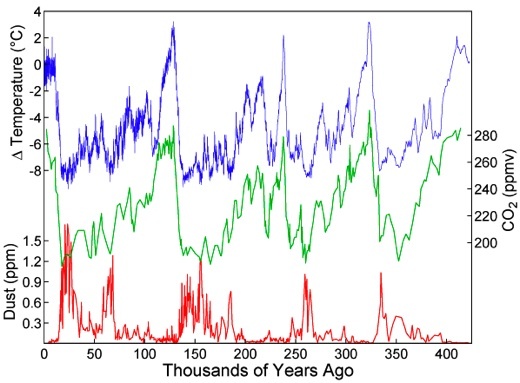 It is of interest that the quasi millennial peaks in Fig 3 are from Greenland while the 1024 year periodicities in Fig 6 are from Antarctica. .The most important factor in climate forecasting is where earth is in regard to the quasi- millennial natural solar activity cycle which has a period in the 960 – 1024 year range. From Fig 4 above it is trivially obvious that the earth is just approaching ,just at or just past a peak in the millennial cycle. 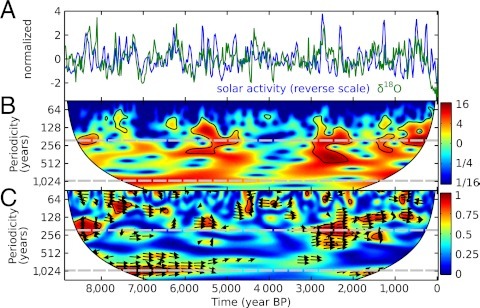 My view ,based on the Oulu neutron count – Fig 8 combined with Figures 4,5, 6 and 7 above is that the solar activity millennial maximum peaked in Cycle 22 in about 1991. 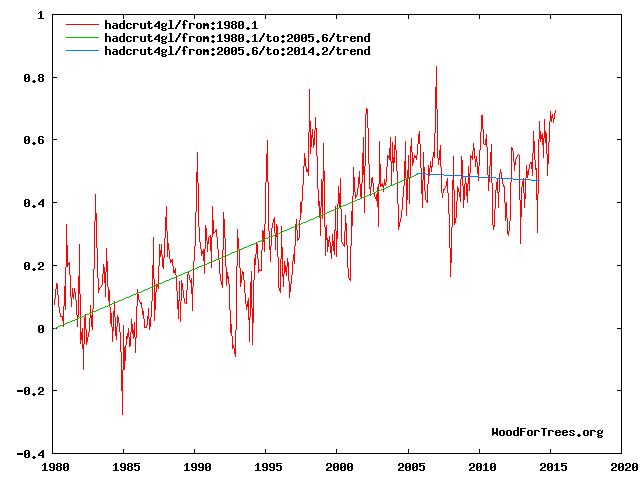 I am a firm believer in the value of Ockham's razor thus the simplest working hypothesis based on the weight of all the data is that the millennial temperature cycle peaked at about 2003 and that the general trends from 990 - 2003 seen in Fig 4 will repeat from 2003-3016 with the depths of the next LIA at about 2640. 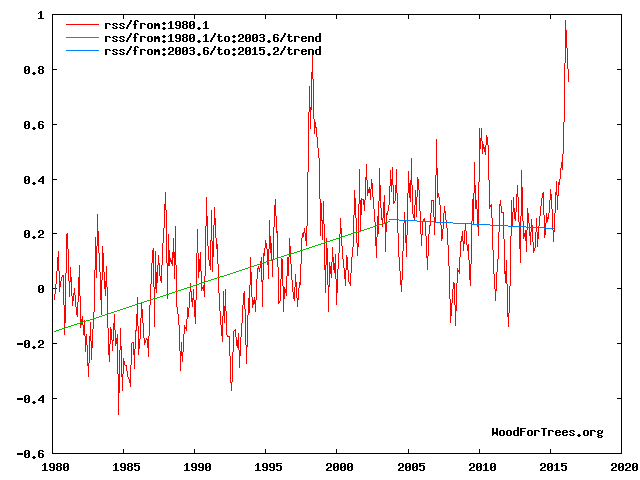 It is worth noting that the increase in the neutron count in 2007 seen in Fig 8 indicated a possible solar regime change which might produce an unexpectedly sharp decline in RSS temperatures 12 years later - 2019 +/- to levels significantly below the blue trend line in Fig 5. It is fashionable in establishment climate circles to present climate forecasting as a "wicked" problem.I would by contrast contend that by adopting the appropriate time scale and method for analysis it becomes entirely tractable so that commonsense working hypotheses with sufficient likely accuracy and chances of success to guide policy can be formulated. The great problem with global warming alarmism, is that it was never based on science. So whilst you are entirely right that the science does not support it, the truth is that it never supported it and instead it was pure belief that kept it going. So, yes, if it were science, then disproving it ought to make it collapse, but because its closer to being a religion simple factual proof that it is wrong will never be enough. The field is approached more like R.A. Fisher analyzing which field in a grid of hybrids has the highest yield , ie : statistical observation in the absence of any overarching theoretical foundation . However , the analysis of planetary temperature is totally an issue of non-optional classical physics . When one looks for the fundamental enabling quantitative equations for the "trapping" of energy by electromagnetic , ie : spectral , phenomena , one finds they don't exist . Spectral phenomena cannot "trap" energy to a higher density than that input . Only gravity , computing as it does as a "negative" energy , can and must and does to compelling accuracy by rather simply derived quantitative equations . Yet it is ruled out of order by all trapped in the GHG paradigm . It is trivial to show that Bob Armstrong is wrong and to disprove the hypothesis that gravity accounts for Earth's temperature. Gravity doesn't predict that spectrum, or explain it in any way. Therefore, the hypothesis is wrong. It's interesting to note that the "science" is fraught with attempts to manipulate data and then force it to fit a computer modeling of the past climate record. When observations don't match the curve fit, change the data. Anyone can see that climate science is not real science. Dr Svalgaard wouldn't approve because he doesn't understand how to work with complex multi-variable systems and so is always unable to make any useful forecasts. The blue line was drawn to simply to illustrate the working hypothesis that we are on the down trend of a millennial cycle cooling trend. Beyond 2015 the trend is currently obscured by the current short term El Nino. "Grandpa says- I'm glad to see that you have developed an early interest in Epistemology. Remember ,I mentioned the 60 year cycle, well, the data shows that the temperature peak in 2003 was close to a peak in both that cycle and the 1000 year cycle. If we are now entering the downslope of the 1000 year cycle then the next peak in the 60 year cycle at about 2063 should be lower than the 2003 peak and the next 60 year peak after that at about 2123 should be lower again, so, by that time ,if the peak is lower, we will be pretty sure that we are on our way to the next little ice age. That is a long time to wait, but we will get some useful clues a long time before that. Look again at the red curve in Fig 3 - you can see that from the beginning of 2007 to the end of 2009 solar activity dropped to the lowest it has been for a long time. Remember the 12 year delay between the 1991 solar activity peak and the 2003 temperature trend break. , if there is a similar delay in the response to lower solar activity , earth should see a cold spell from 2019 to 2021 when you will be in Middle School. We can watch for these things to happen but meanwhile keep in mind that the overall cyclic trends can be disturbed for a time in some years by the El Nino weather patterns in the Pacific and the associated high temperatures that we see in for example 1998 ,2010 and especially from 2015 on." You were very wrong in 2012. Have you learned nothing from that? Obviously the current El Nino peak is a short term interruption of the decadal trend. However I am happy and surprised that you agree with me about climate models. You need to draw the logical conclusions which derive from that agreement which again surprisingly the IPCC does but then ignores. Here is what my post said. Paradoxically they still claim that UNFCCC can dial up a desired temperature by controlling CO2 levels .This is cognitive dissonance so extreme as to be irrational. There is no empirical evidence which proves that CO2 has anything more than a negligible effect on temperatures. " As to the thousand year cycle you say "
"A thousand-year cycle? Based on what? Page doesn't say. Instead he is stuck in the past, not realizing that manmade forcings have changed everything." This is entirely false - I presented evidence of the millennial cycle and its peak in 2003 +/- in Figs 3,4,5 and 6.The fact is that man made CO2 emission forcings have changed very little with regard to temperature but have substantially enhanced food production. Norman, no data support your 2012 claim -- you were as wrong as you could be. And now you're making essentially the same one again. I was once worried about this idea that manipulations by land-sea reconstructions were creating false data, then I did own reconstruction and got the exact same result. In fact it is rather surprising how robust the general trend is, you don't even need many samples or adjustments if you work with a constant subset of temperature stations over a time range. Do you suppose he managed to join the Orwellian forces along with various americans, japanese, and british scientists? Somehow the Koch brothers funding led him to make the same fake manipulations as the rest? How would Ockham's razor apply here? Josef Loschmidt (Maxwell's teacher) was the first to realistically determine the size of air molecules - quite a feat in the 19th century. There is no correct peer-reviewed published refutation of his gravito-thermal effect, which is based on and derived directly from the Second Law of Thermodynamics, that law also never proven incorrect. There's a US $7,500 reward offered at https://itsnotco2.wordpress.com if you or any reader can prove me wrong and produce a study confirming water vapor warms to the extent implied by the IPCC. Furthermore, the Loschmidt effect is now proven empirically in hundreds of 21st century experiments. The existence of this gravitationally induced temperature gradient means the IPCC doesn't have a leg to stand on regarding CO2. Hence there is no need for James Hansen's guesswork that radiation from a cold atmosphere must be heating an already-warmer surface, because it is the force of gravity acting on molecules between collisions that produces both a density gradient and a temperature gradient. The Second Law of Thermodynamics tells us that in Nature there is an autonomous propensity for a system to move towards the state of thermodynamic equilibrium, which state has maximum entropy. However, this state in a force field is NOT isothermal. That is, there exists a non-zero temperature gradient which we can understand and quantify using the Kinetic Theory of Gases. 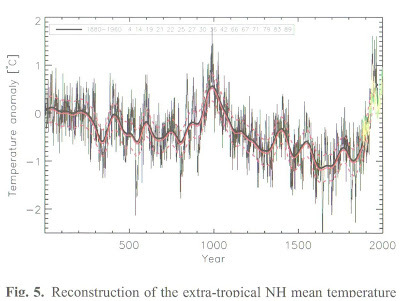 The observation of cycles from the past informs us that climate has never been stable. To suggest that the cycles of the past will likely be evident in the future is plausible. However, the system evolves continuously. It has a life. The energy available via solar radiation varies little. But, according to the level of cloud albedo the energy absorbed by the oceans to depth, to little effect in changing surface temperature in the ocean itself varies a lot. The ozone content of the air depends on the zonal wind in high latitudes, a proxy for the the rate of intake of ozone poor NOx rich mesospheric air into the atmosphere at the poles....that gets to be immediately mixed in across the polar vortex per medium of polar cyclone activity that is strongest at 300hPa to 50 hPa, convection and simple migration to lower latitudes. Much more aggressive in Antarctica, hence the ozone deficit in the southern hemisphere. The zonal wind depends on the interaction of the solar wind that changes on 200 year time scales and the Earth's magnetic field that we know little about. In fact we don't know a whole lot about either. "But it appears that a cooling trend has been established: https://reality348.wordpress.com/2016/01/13/6-the-poverty-of-climatology/"
Actually all kinds of temperature measurements are setting record highs. The HadSST3 monthly SST has been the warmest in the record for 13 consecutive months. My 2012 forecast of a cooling trend from 2003 on is looking good with the rapid collapse of the current El Nino. See figs 5 and 5a above.The cooling trends are truncated to exclude the current El Nino as an end point. The Enso events are temporary aberrations which don’t have much influence on the trends – see the 1998 and 2010 events in Figs 5 and 5a. Who are you trying to fool, anyway? If we are going to argue that it is sensible to trim ENSO events from the end of the span in order to get the trend line we want, don't you think we should trim the ENSO event at the start of the time span as well? RSS has many different data sets available. Which is the data set shown in Fig 5? TLT? Which as of this month looks like https://docs.google.com/spreadsheets/d/1ZGbNp0ph7p1s4lyTiMhw2g_yos3sPFeu24W80CrWyos/edit?usp=sharing since 2003? It looks to be the RSS data for TLT, but Norman completely cherry picks his trend starting and stopping dates, and ignores considerations of statistical significance. Page's trend line from 2005 to 2015 is *not* statisticlly significant -- from 1/2005 to 12/2015, I calculate the statistical significance of the (slight warming) linear trend to be only 52%. By the way, the trend from 1/2005 to present, 5/2016, is a much larger +0.12 C/decade, and statistically significant at the 99% confidence level. So "trimming" ENSOs matters a great deal. There's no scientific justification for it. Norman is a classic case of denialism, which shows it can happen even to PhDs who have some specific science training in their field but are unable to translate that to elsewhere. I am putting forward what I consider a useful working hypothesis based on some simple observations. Figs 3 -6 show that a millennial temperature cycle peaked at about 2003/4. Figs 7 -8 show that this peak may well correspond to the millennial solar activity peak at 1991 .The delay is because of the thermal inertia of the oceans. What is not to like? Y'all are not seeing the wood for the trees. "Figs 3 -6 show that a millennial temperature cycle peaked at about 2003/4." Among the years 1880-2015, 2003 ranks as only the 10th warmest, and 2014 the 14th warmest(NOAA data). Since then there have been six warmer years. "I am putting forward what I consider a useful working hypothesis based on some simple observations." You have lost the right to be taken seriously. "The establishment make a gross error of scientific judgement by projecting straight ahead beyond the millennial inflection point at about 2003. - See Fig 1"
That was from a paper written by one person. How is one person the "establishment," Norman. All of the IPCC, Met Office and NASA projections and their scary propaganda are based on various versions of the warming trend shown in Fig 1 labelled IPCC prediction. None of them honor the hypothesized inflection point at the millennial temperature peak at about 2004. You are certainly free to ignore any working hypothesis or evidence which might make you uncomfortable and question your beliefs and assumptions. Why, based on the physics, should there be an "inflection point" at 2004? ?